Amouage will launch Beloved Man, the masculine counterpart to last year's Beloved Woman. Created in Grasse under the guidance of Amouage’s Creative Director Christopher Chong, he explains "that everyone has a remembrance of a loved one and the fragrance is a nod to the 1980 movie “Somewhere in Time” starring Christopher Reeve and Jane Seymour. This intimate fragrance with its selection of rich woods and resins in the base enrapture the wearer in a comforting sensation of warmth that these treasured memories bring". Beloved Man was developed by perfumer Bernard Ellena; notes for the woody oriental include orange, grapefruit, elemi, geranium, jasmine, iris, saffron, cedarwood, lignum vitae, leather, patchouli, vetiver and musk. 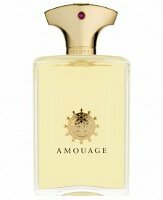 Amouage Beloved Man will be available in 100 ml, concentration unknown. Eek! I’ve had a sample of this for a couple of weeks and am reminded that I have yet to try it. I was impressed with Beloved Woman, so I’m looking forward to trying this. I have eight of the listed notes growing in my yard. Weird. I haven’t tried anything by Bernard Ellena. Is his style similar to his brother and niece’s? No, but then, he has spent most of his career doing more mainstream work. if it’s half as good as the notes described, it will be my next full bottle purchase. but i am prepared for another disappointment. i have a friend who dined with christopher chong recently and christopher described beloved as a no surprise, classical in the best modern masculine way, perfume, for men who don’t wear perfume or don’t want to be noticed wearing perfume. perfect for day wear and office, unthreatening. i’d prefer in that case to wait for their next release which has been confirmed it will be a leather perfume. Hope all is well, I had a chance to try out the new Beloved Man last week . The fragrance concentration is very high for an EdP at 30-35% and the price is £265. It’s exclusive to Harrods and the Lowndes Street Amouage boutique and has an amazing list of ingredients. “Beloved is a woody spicy oriental fragrance with top notes of black pepper and cardamom enhanced with rich floral in the heart. The selection of rich woods and resins in the base ads warth and comfort to this distinctive fragrance”. As one can see from above there are a huge number of ingredients and thus I would say the fragrance would be very subjective to ones skin chemistry so please do take my humble opinion like a pinch of salt.From the beginning it opened very warm, sweet and very spicy. The warmth and sweetness had almost tonka/coumarin like qualities making it almost gourmand. As there was so much going on in the perfume, I felt I had to put all my focus on my nose to isolate the notes and on deep inhalations I felt there was a sharp cardamom with the clovebud balancing the edges very lightly. A heavy pepper note was present which worked with the warm spicy notes. My nose could not trace any citrus although according to the above list they were there. Within the depth of this warm sweetness I could very lightly sense the freshness of frankincense in the background. Again there is way too much going on and all I get for now if I were to smell lightly is a tonka based oriental. *After two hours the florals and woods come in to the forefront with the warm sweetness still there which has strangely changed in to a buttery soapiness. The cumin has now come and working very beautifully with the jasmine and now one can sense where all this warmth of this fragrance comes from………its the cumin! The cumin is quite strong but the florals i.e. geranium and jasmine has tamed it so all one can sense is the warmth of this spice. Due to the cumin I can’t sense the resins too much but I can sense their synergy with the florals. I can lightly sense something ever so slightly camphoric right at the back which may be producing all this sweetness……frankly I wish I knew. .Now its a good 7 hours since I sprayed the perfume and I feel the whole composition has calmed down but still smelling quite sweet leaving behind a nice light trail of sweet musk which also had a strange but quite strong woody aquatic note. You may ask where does this aquatic note comes from, again honestly I’ve no idea, as this is what I and those around me have perceived. Overall I’m impressed by the complexity of the composition and how certain ingredients work together in perfect synergy to create different accords, however it was not for me as it smelled almost quite generic for an Amouage. I feel as though it was going in the same direction as Interlude and possibly Reflection. Due to the huge number of ingredients in Beloved I can foresee this fragrance working very differently on others, however I feel on my self the cumin came out too much albeit it was tamed by the other notes and the sweetness was too tenacious and eventually was quite overwhelming.